Cardiac arrest is a life-threatening condition with an overall poor prognosis. Mortality of patients admitted to the intensive care unit after out-of-hospital cardiac arrest is around fifty percent. While early in-hospital mortality is mainly due to hemodynamic failure, half of survivors after hospital discharge suffer irreversible neurological sequelae or die within a few months . In addition, withdrawal of life-sustaining therapies in patients with presumed poor prognosis accounts for a significant number of in-hospital deaths [2, 3]. Decision to withdraw life assistance is a difficult task which necessitates accurate prognostication tools such as pathologic patterns on electroencephalograms, neuroimaging, absent pupillary reflexes to light, and absent somatosensory evoked potentials [4-7]. Neuron-specific enolase (NSE) is recommended by current guidelines in multimodal strategies , and high serial levels afford the best prediction . Continuous monitoring of bispectral index, an indicator of brain activity, has shown some promise in prognostication after cardiac arrest . Combined assessment of bispectral index and the neuron-enriched S100 beta protein provided an added prognostic value over single parameters . New biomarkers would be invaluable for improving risk stratification and allow healthcare to be adapted according to outcome, optimizing treatment to patients likely to survive while avoiding futile and costly resources to patients with irreversible neurological sequelae . It would also provide relatives with information about outcome at an earlier stage, limiting uncertainty and distress. The biomarker value of circulating microRNAs (miRNAs) has been extensively studied since the discovery that these small non-coding RNA molecules regulating gene expression are present in the bloodstream . MicroRNAs appear to have the potential to improve personalized healthcare of patients with heart disease . A few studies have indicated that circulating miRNAs may predict outcome after cardiac arrest. In two small-scale studies, plasma levels of miR-122-5p and miR-124-3p were associated with neurological outcome and survival after cardiac arrest [15, 16]. MiR-122-5p is enriched in the liver and is involved in lipid metabolism, inhibiting fatty acid oxidation and promoting fatty acid and triglyceride biosynthesis . MiR-122-5p is also involved in glucose homeostasis and is consistently present in the blood, hence its potential biomarker value for cardiovascular and metabolic diseases . Accordingly, plasma levels of miR-122-5p were found to be increased in a porcine cardiogenic shock model . Recent investigations identified miR-122-5p in other organs such as the kidney , aortic valves  and the myocardium of patients with severe aortic stenosis where it regulates fibrosis . In a discovery phase with small RNA sequencing, we observed an association between circulating levels of miR-122-5p and outcome after cardiac arrest . In vitro, miR-122-5p has been shown to be expressed in different cell types including hepatocytes, fibroblasts and neuronal cells [15, 22]. The predictive capacity of brain-enriched miR-124-3p, whose circulating levels reflect the extent of brain damage after cardiac arrest, was recently confirmed in the large Targeted Temperature Management trial (TTM trial) , a trial designed to address the potential benefit of targeted temperature management at 33°C vs. 36°C on outcome after out-of-hospital cardiac arrest . In the present sub-study of the TTM trial, we assessed the incremental value of miR-122-5p to predict neurological outcome and survival after cardiac arrest. Between November 2010 and July 2013, the 36 recruiting centers of the TTM trial enrolled 939 unconscious adult patients admitted to an intensive care unit after an out-of-hospital cardiac arrest of presumed cardiac cause. Patients were randomized to either targeted temperature management at 33°C or 36°C. The trial has received ethical approval from each participating country. Informed consent was obtained from each participant or relatives, according to the legislation in each country, and in line with the declaration of Helsinki . Detailed TTM trial design, protocol, statistical analysis, results and interpretation have been published [24, 26, 27]. The trial is registered at www.clinicaltrials.gov (NCT01020916). Of the 36 recruiting sites, 29 collected blood samples in a total of 700 patients. Blood samples were stored at the Integrated Biobank of Luxembourg in compliance with the International Society for Biological and Environmental Repositories Best Practices and with International Organization for Standards (ISO 9001:2008, 17025:2005 and NF S96-900:2011). The biomarker steering committee and steering group of the TTM trial approved this sub-study. The primary endpoint used in the present sub-study was poor neurological outcome as determined by a cerebral performance category (CPC) score  at 6 months of 3, 4 or 5. A CPC score of 3 indicates severe neurological sequelae, 4 indicates coma or vegetative state, and 5 indicates death. Patients with a CPC score of 1 or 2, indicating no or moderate neurological sequelae respectively, were considered as having a good outcome. Determination of CPC was achieved as described in the TTM trial protocol . The secondary end-point considered in this sub-study was survival until the end of the trial. Circulating levels of miR-122-5p were measured in serum samples collected 48 hours after return of spontaneous circulation (ROSC), as described previously [23, 29] and in the online supplement (Methods and Figure S1). Levels of miR-122-5p were normalized with Cel-miR-39 and are expressed as number of miR-122-5p copies per µL of serum. For a time-course experiment, levels of miR-122-5p were also measured in serum samples from a sub-group of 43 patients for whom samples were available at 24, 48 and 72 hours after cardiac arrest. Neuron-specific enolase (NSE) was assessed in serum samples collected 48 hours after ROSC. Measurements were performed in a core laboratory 6 months after completion of the trial, as previously described . Comparisons between two groups of continuous variables were performed using the Mann-Whitney test. Categorical variables were compared with the Chi-square test or the Fisher exact test. A P value <0.05 was considered statistically significant. Comparisons of miR-122-5p levels between two groups of patients were performed using the Mann-Whitney test. Associations between miR-122-5p levels and co-morbidities were determined using logistic regression. Correlations between miR-122-5p levels and age were determined using the Spearman test on ranks. Both univariable and multivariable analyses with logistic regression were conducted to assess the association between miR-122-5p after log10 transformation and neurological outcome as determined by dichotomized CPC at 6 months: CPC 1-2 being considered a good neurological outcome (0 value) and CPC 3-5 being considered a poor neurological outcome (1 value). For univariable analyses, the association between miR-122-5p and neurological outcome was assessed using the area under the receiver operating characteristic (ROC) curve (AUC). Odds ratios (OR) and 95% confidence intervals [95% CI] were computed for an increase of 1 unit for continuous variables, which were centered and scaled. Missing data were computed using 10-fold multiple imputation. Prediction value of multivariable models was estimated using the Akaike information criterion (AIC). Lower AIC is indicative of better model fit. The statistical significance of the decrease in AIC was assessed using the likelihood ratio test. The AIC was chosen to assess the predictive value of models when consecutively adding variables (i.e. miR-122-5p) to a baseline clinical model since it is penalized by the number of variables entered in the model, contrarily to the AUC. This allows to avoid model over fitting by the multiplication of co-variates. The incremental predictive value of miR-122-5p to the baseline model that included demographic and cardiac arrest-related clinical parameters was evaluated by the decrease in AIC and the integrated discrimination improvement (IDI). Cox proportional hazards and Kaplan-Meier curves were analyzed to evaluate the association between miR-122-5p after log10 transformation with survival until the end of the trial. For Cox proportional hazards, the association between miR-122-5p and survival was evaluated after adjusting with clinical variables using 10-fold multiple imputation. For Kaplan-Meier analysis, miR-122-5p levels were divided in quartiles. Between-group comparisons were performed using the SigmaPlot v 12.3 software. Prediction and survival analyses were performed using the R statistical environment (3.2.2) with the packages pROC, lmtest, survival and Hmisc. A study design flow-chart is displayed in the Online supplement (Figure S2). A total of 939 patients were enrolled in the TTM trial. Among the 36 recruiting sites, 29 sites collected blood samples for sub-studies. In the present sub-study, we included 590 patients who survived the first 24 hours after ROSC and who had blood samples available for miRNA assessment (=miRNA cohort). Serum blood samples obtained 48 hours after ROSC were used for miR-122-5p assessment. This time-point was chosen for consistency with past studies [11, 15, 23, 30] and because the predictive value of NSE was highest 48 hours after cardiac arrest . The miRNA cohort had comparable demographic and clinical characteristics to the entire TTM cohort, except that fewer patients from the miRNA cohort had a medical history of myocardial infarction (Table S1 in the Online supplement). 80 % of patients in the miRNA cohort were males and the median [range] age was 64 (20-94). 307 (52%) patients had a good neurological outcome at 6 months (CPC scores 1-2) and 283 (48%) patients had a poor neurological outcome or died (CPC scores 3-5) (Table 1). Patients with a poor neurological outcome or who died within 6 months after cardiac arrest were older, had more often co-morbidities and an initial non-shockable rhythm compared to patients with a good neurological outcome. Time from cardiac arrest to ROSC, initial serum lactate levels and the frequency of circulatory shock on admission were higher in patients with poor outcome (Table 1). Of the 590 patients enrolled in this study, 286 (48%) were randomized to 33°C and 304 (52%) to 36°C. 147 (51%) patients randomized to 33°C had a good outcome and 160 (53%) patients randomized to 36°C had a good outcome (p=0.92). In the 33°C group, levels of miR-122-5p were moderately but significantly higher compared to the 36°C group (Figure 1A). Demographic and clinical features of patients with good and poor neurological outcome within the miRNA cohort. Continuous characteristics are indicated as median (range) and categorical characteristics are indicated as number (frequency). CA: cardiac arrest; COPD: chronic obstructive pulmonary disease; CPR: cardio-pulmonary resuscitation; IHD: ischemic heart disease; MI: myocardial infarction; PEA: pulseless electric activity; ROSC: return of spontaneously circulation; VF: ventricular fibrillation; VT: ventricular tachycardia. Serum levels of miR-122-5p according to targeted temperature and neurological outcome. Levels of miR-122-5p were assessed 48 hours after ROSC using quantitative PCR in 590 patients. (A) Comparisons of miR-122-5p levels between patients treated at 33°C and patients treated at 36°C. (B-D) Comparisons of miR-122-5p levels between patients with good (CPC 1-2) and poor (CPC 3-5) neurological outcome, independently of targeted temperature (B), in patients treated at 33°C (C) and in patients treated at 36°C (D). Patient numbers are displayed in italics. Levels of miR-122-5p are expressed as copy numbers per µL of serum. Y axes are in log scale. The lower boundary of the boxes indicates the 25th percentile, the horizontal line within the box indicates the median, the higher boundary of the box indicates the 75th percentile, the error bars indicate the 90th and 10th percentiles, and individual dots represent outliers. Levels of miR-122-5p were lower in patients with poor outcome compared to patients with good outcome (Figure 1B). The outlier with high levels of miR-122-5p in the good outcome group did not affect this difference, nor did it affect the prediction analyses, and was therefore kept in all subsequent analyses. 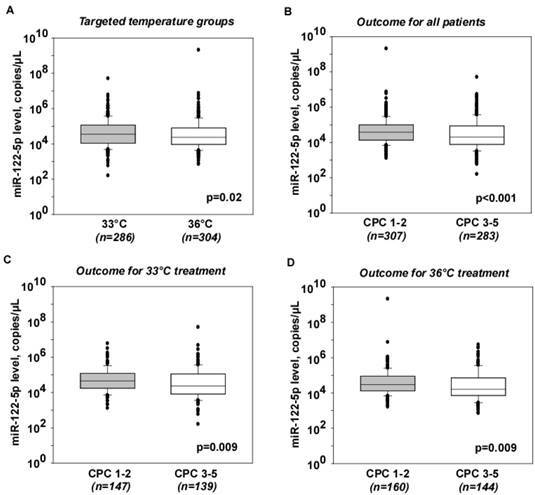 The difference in miR-122-5p levels between patients with good and poor outcome was independent of targeted temperature regimen (Figure 1C-D). Consequently, patients were not separated into targeted temperature regimen groups in subsequent analyses. Levels of miR-122-5p were inversely associated with chronic heart failure (OR 0.59 [0.35-0.99], n=33) and history of arrhythmias (OR 0.73 [0.54-0.99], n=99). No significant associations were detected with other co-morbidities listed in Table 1. No patient had cirrhosis. Levels of miR-122-5p were inversely correlated with age (r=-0.24, P<0.001; Figure S3 in the Online supplement), although this correlation was not significant (p=0.43) in linear regression analysis. Levels of miR-122-5p tended to be higher in males compared to females (median 4.6x105 copies/µL vs. 2.7x105 copies/µL, respectively; p=0.08). Levels of miR-122-5p were positively correlated with the levels of miR-124-3p assessed previously  (r=0.35, p<0.001; Figure S4 in the Online supplement). Levels of miR-122-5p were assessed in a sub-group of 43 patients for whom serum samples were available at 24, 48 and 72 hours after cardiac arrest. Levels of miR-122-5p gradually decreased from 24 hours to 72 hours after cardiac arrest, both in the good and poor outcome groups (Figure S5 in the Online supplement). In univariable analyses, levels of miR-122-5p were associated with 6-month neurological outcome, as determined by dichotomized 6-month CPC (CPC 1-2 vs CPC 3-5), with an AUC of 0.62, 95% CI [0.54-0.63] (Figure 2). Patients with lower levels of miR-122-5p were at high risk for a poor neurological outcome (OR [95% CI]: 0.71 [0.57-0.88]). Association between levels of miR-122-5p and neurological outcome. Circulating levels of miR-122-5p were assessed using quantitative PCR in serum samples collected 48 hours after ROSC in 590 patients. Association between miR-122-5p and neurological outcome assessed by dichotomized CPC at 6 months (CPC 1-2 vs. CPC 3-5) was evaluated using logistic regression. ROC curve and AUC are shown. In multivariable analyses - including age, gender (male), time from cardiac arrest to ROSC, bystander cardiopulmonary resuscitation (CPR), first monitored rhythm (ROSC after defibrillation or ventricular tachycardia (VT)-ventricular fibrillation (VF)), circulatory shock on admission, initial serum lactate levels, NSE levels at 48h, targeted temperature regimen and miR-124-3p -, levels of miR-122-5p were independent predictors of neurological outcome (OR [95% CI]: 0.51 [0.37-0.68]; Figure 3A). Age, first monitored rhythm (VT-VF), NSE and miR-124-3p also had a significant predictive value. Of note, temperature regimen was not associated with neurological outcome, confirming previous data from the main TTM trial . The model reached a specificity of 91% and a sensitivity of 77%. To evaluate the incremental predictive value of miR-122-5p, we calculated the AIC of models including the demographic and cardiac arrest-related variables described above (=baseline model), with or without miR-122-5p and miR-124-3p. Results are summarized in Table 2. Adding miR-124-3p to the baseline model resulted in a decrease of AIC from 471 (baseline model) to 466 (p=0.01), but failed to reach statistical significant in terms of IDI (0.006 [-0.001-0.013]), p=0.095, as previously reported . Adding miR-122-5p to the baseline model resulted in a decrease of AIC from 471 to 463 (p=0.002) and provided an IDI of 0.016 [0.007-0.025], p=5.0x10-4. Addition of miR-122-5p to the baseline model with miR-124-3p decreased the AIC from 466 to 446 (p<0.001) and provided an IDI of 0.03 [0.02-0.04], p=1.3x10-5. Furthermore, adding both miR-122-5p and miR-124-3p to the baseline model improved the prediction (decrease of AIC from 471 to 446, p<0.001, and IDI of 0.04 [0.02-0.05], p=2.6x10-6. Overall, both miR-122-5p and miR-124-3p were necessary to reach the maximal predictive value. Multivariable analyses. Odds ratios (OR) and hazard ratios (HR) ± 95% confidence intervals (95% CI) are displayed for the prediction of 6-month neurological outcome (A) and survival until the end of the trial (B) respectively. The following variables were included in the models: age, gender (male), time from cardiac arrest to ROSC, bystander cardiopulmonary resuscitation (CPR), first monitored rhythm (ROSC after defibrillation or ventricular tachycardia (VT)-ventricular fibrillation (VF)), circulatory shock on admission initial serum lactate levels, NSE levels at 48h, targeted temperature regimen, and miRNA levels. Cox proportional hazards models and Kaplan-Meier curves were analyzed to assess the association between circulating levels of miR-122-3p and miR-124-3p measured 48 hours after ROSC and survival until the end of the trial. Longest follow-up time was 956 days after cardiac arrest, and median time from cardiac arrest to death was 7 days. 43% of patients were dead at the end of the trial. In Cox proportional hazards models including the same clinical and demographic parameters as used in logistic regression for the prediction of neurological outcome, lower levels of miR-122-5p and higher levels of miR-124-3p predicted a shorter survival (Figure 3B). Age, first monitored rhythm (VT-VF), lactate and NSE were also significantly associated with survival. Targeted temperature regimen was not associated with survival, as previously reported . 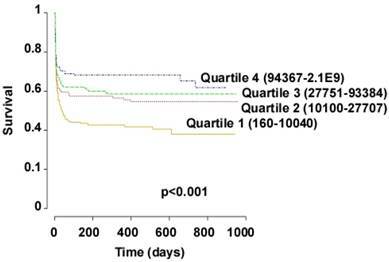 In Kaplan-Meier analysis, patients within the lowest quartiles of miR-122-5p levels were at high risk of shorter survival (Figure 4). Overall, patients with low levels of miR-122-5p were at high risk of death. Survival analyses. Kaplan Meier curves show the survival of patients according to their circulating levels of miR-122-5p measured 48 hours after ROSC in 590 patients. Levels of miR-122-5p were divided into quartiles. Ranges of miR-122-5p values in number of copies per µL of serum are indicated for each quartile. P value of Log-Rank test is shown. Incremental value of miR-122-5p to predict neurological outcome as assessed by 6-month CPC score. The baseline model includes age, gender, bystander cardiopulmonary resuscitation (CPR), first monitored rhythm, time from cardiac arrest to ROSC, initial serum lactate levels, shock on admission, 48h-NSE, and targeted temperature regimen. Log10-transformed miRNA values were used in these analyses. AIC: Akaike information criteria. Lower AIC indicates a better predictive value. IDI: integrated discrimination improvement. * The comparison of AIC between the baseline models with miR-124-3p or miR-122-5p could not be performed with the likelihood ratio test because the two models are not nested (i.e. variables of the first model are not a subset of the variables of the second model and vice versa). The association between miRNAs and outcome after out-of-hospital cardiac arrest has been reported previously. Circulating levels of brain-enriched miR-124-3p were associated with outcome in a previous sub-study of the TTM-trial . In the present study, we addressed the value of miR-122-5p to improve outcome prediction after cardiac arrest. We observed that miR-122-5p was an independent predictor of neurological outcome and survival after cardiac arrest and provided an incremental prognostic value. 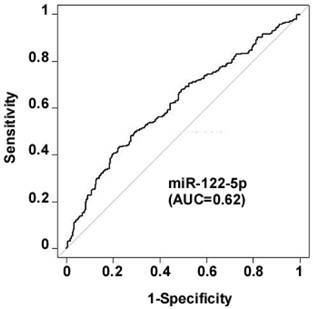 The selection of miR-122-5p was based on a previous study indicating that this miRNA is associated with outcome after cardiac arrest . Surprisingly, we found in the present study an inverse association between miR-122-5p levels and the risk of poor outcome after cardiac arrest, while miR-122-5p was positively associated with poor neurological outcome and mortality in our previous study . Several explanations might exist for this discrepancy. Two independent cohorts of patients with cardiac arrest were used in the past  and present study, which differed substantially with respect to their size and design (small monocentric cohort in the past study versus large multicenter cohort in the present study), but similar in relation to there being no apparent link between miR-122-5p levels and liver function. This is important considering that miR-122 is enriched in the liver. In the present study, miR-122-5p levels were neither associated with the presence of shock on admission, which induces multiple organ damage including the liver, nor with the liver sub-score of the sequential organ failure assessment score , which was calculated from the highest bilirubin level each day in the intensive care unit (not shown). Even though fine characterization of liver function was not performed in the TTM-trial, the inverse relationship between miR-122-5p levels and poor outcome does not support a confounding effect of underlying liver disease on the predictive value of miR-122-5p. The Predictive Safety Testing Consortium (PSTC) of the Safer and Faster Evidence-based Translation (SAFE-T) Consortium estimated the mean circulating levels of miR-122 as approximately 2000 copies/µL in the normal population and the upper limit of normal to 13,000 copies/µL . In our cohort of cardiac arrest patients, 77% of patients from the good outcome group had miR-122-5p levels above 13,000 copies/µL while only 38% of patients from the poor outcome group had such elevated levels. Together with the lower levels of miR-122-5p in the poor outcome group compared to the good outcome group, this observation suggests that patients from the poor outcome group may not be able to increase their levels of miR-122-5p in response to injury. This needs further investigation. The inverse association with outcome between miR-122-5p and miR-124-3p most likely explains the ability of miR-122-5p to provide an incremental value to a prognostic model including miR-124-3p. The modest yet significant collinearity between the two miRNAs is not strong enough to prevent the incremental value of miR-122-5p. This strengthens the concept that panels of miRNAs with different function or reflecting different pathophysiology are likely to have added value. Such miRNA panels have been reported in the past to predict outcome after acute myocardial infarction . Furthermore, a miR-122-5p/133b ratio has shown some value to predict the risk of developing major adverse events after acute myocardial infarction . In the case of cardiac arrest, adding another brain-enriched miRNA to a model already including miR-124-3p would have a weak chance for providing an incremental predictive value. The inverse association between age and miR-122-5p may not merely be responsible for the association between miR-122-5p and outcome since, in multivariable analyses, miR-122-5p was an independent predictor in a model including age as a covariate. In addition, the correlation between age and miR-122-5p, even though significant, was weak (r=-0.24, P<0.001; Spearman test) and lost significance in linear regression. Therefore, despite its correlation with age, miR-122-5p still appears robust as an independent prognostic marker. This leads to the question of a potential functional link between circulating levels of miR-122-5p and outcome after cardiac arrest. MiR-122-5p is expressed in cultured brain cells  but, since it is inversely associated with a poor neurological outcome in the present study, this association may not be only explained by a release of miR-122-5p from dying neuronal cells, as it is believed to be the case for brain-enriched miR-124-3p. The inverse association between miR-122-5p and poor outcome is against a causal relationship between liver failure, circulating levels of miR-122-5p, and poor outcome. Even though miR-122-5p levels were shown to be decreased in patients with renal failure , the very low proportion of patients with renal failure in the present study is unable to account per se for the association between miR-122-5p and outcome after cardiac arrest. Overall, miR-122-5p levels were not associated with the different organ-specific sub-scores of the sequential organ failure assessment score (not shown). The decrease of miR-122-5p levels over the 3 days following cardiac arrest may indicate a depletion of liver miR-122-5p at an early stage after cardiac arrest. This would encourage addressing the prognostic value of miR-122-5p at admission or in the few hours after cardiac arrest. Being able to predict outcome at an early stage after cardiac arrest would be of high clinical interest. In both animal experiments  and in vitro investigations [37, 38], the use of targeted temperature management (therapeutic hypothermia) modified the expression levels of some miRNAs in the brain. In a cardiogenic shock model in pigs, hypothermia decreased the plasma levels of miR-122-5p . We found that miR-122-5p levels were modestly higher in patients randomized to the 33°C-group compared to patients randomized to 36°C. This difference did not affect the association between miR-122-5p and neurological outcome, and targeted temperature management regimen was not associated with outcome in multivariable analyses. This is consistent with the absence of significant effect of targeted temperature management at 33°C compared to 36°C on neurological outcome observed in the main TTM trial . The main finding of the present study is that miR-122-5p has an incremental prognostic value to a clinical model including the previously described miR-124-3p . This is important since, in our previous study , miR-124-3p failed to reach a statistically significant effect on outcome prediction. The incremental value of miR-122-5p observed in the present study was demonstrated in multivariable analyses in which this miRNA increased model fit, as attested by a decrease of AIC, and improved patient classification, as attested by a significant IDI. As a reminder, the AIC was used to assess the predictive value of multivariable models instead of the AUC since it is penalized by the number of variables entered in the model, thus avoiding model over fitting. Our findings have important potential clinical implications. Identification of novel biomarkers of outcome after cardiac arrest is needed since current biomarkers lack specificity. These novel biomarkers, combined with previously characterized brain-derived proteins such as NSE  and S100 beta , as well as clinical and neurophysiologic examination, may aid in identification of patients at high risk of poor outcome. Diagnostic assays to measure miRNAs on a routine basis are being implemented . These assays are sensitive, do not require a high volume of blood, can be multiplexed and automated, and may therefore be cost-effective. Presuming that the incremental value of miRNAs for outcome prediction after cardiac arrest can be confirmed in future large-scale studies, multiplex miRNA assays could be developed and used in multimodal prediction algorithms involving clinical examination, neurophysiologic tests and brain imaging. These miRNA assays could aid in personalizing healthcare, not only of patients with cardiac arrest, but also of patients with cerebrovascular diseases such as stroke. This study has a number of strengths and limitations. One strength is that it is a predefined sub-study of the largest prospective multicenter randomized clinical trial testing the benefit of two target temperature regimens in cardiac arrest patients. Blood samples used for biomarker determination were stored in a single biobank according to best practices and international standards. Furthermore, miR-122-5p assessment was performed in a single laboratory, thus allowing to maximize consistency of sample handling and processing. Measurement of miR-122-5p was performed according to extensively characterized and validated procedures. Levels of miR-122-5p are expressed as an absolute concentration (copy number per µL of serum), while the majority of past miRNA studies reported relative concentrations. Although it may be difficult to implement for weakly expressed miRNAs (which is not the case of miR-122-5p), the absolute quantification method has the advantage of allowing for comparisons of expression levels between different analytical platforms. One limitation relates to the selection of only one miRNA for this study, and it cannot be excluded that other miRNAs might have a further added prognostic value. In addition, this study was performed in a sub-group of patients of the TTM-trial for whom blood samples were available for biomarker studies. However, this sub-group had comparable demographic and clinical characteristics to the entire cohort. The evolution over time of miR-122-5p levels in the 3 days following cardiac arrest was performed in a small subgroup of patients and only miR-122-5p levels measured 48h after ROSC were used in prediction analyses. Further studies are warranted to determine the best time-points for optimal prediction, as well as the influence of renal function on the circulating levels of miRNAs such as miR-122-5p. Finally, a biologically plausible explanation for the inverse association between miR-122-5p levels and outcome remains to be established. In conclusion, we have shown that miR-122-5p is associated with neurological outcome and survival after cardiac arrest. 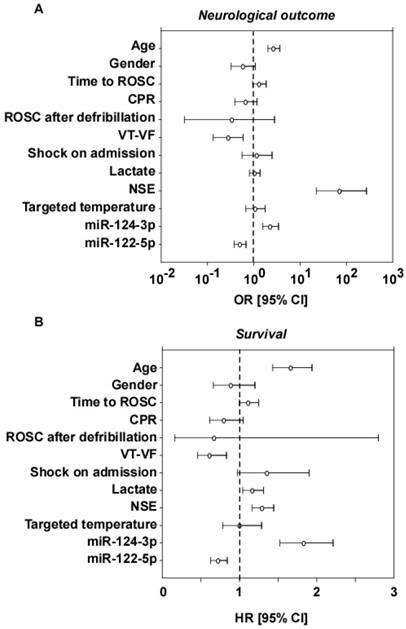 Levels of miR-122-5p measured 48 after ROSC provide an incremental predictive value and may constitute a novel biomarker to aid in outcome prediction after cardiac arrest. We thank all staff from the recruitment sites involved in the biomarker studies. We also thank Olivier Collignon and Francois Fays for expert statistical advice. This sub-study was supported by the Ministry of Culture, Higher Education and Research and the National Research Fund of Luxembourg (grants # C14/BM/8225223 and AFR 8832104). The TTM-trial and the TTM-trial biobank were funded by independent research grants from: Swedish Heart Lung Foundation; Arbetsmarknadens försäkringsaktiebolag (AFA)-insurance Foundation; The Swedish Research Council; Regional research support, Region Skåne; Governmental funding of clinical research within the Swedish NHS (National Health Services); Thelma Zoega Foundation; Krapperup Foundation; Thure Carlsson Foundation; Hans-Gabriel and Alice Trolle-Wachtmeister Foundation for Medical Research; Skåne University Hospital; Sweden, TrygFonden, Denmark, the European Clinical Research Infrastructures Network and the European Critical Care Research Network. There was no commercial funding. Funding organisms did not have any access to the data nor did they have any influence on their analysis or interpretation.